O’Byrne, 26, has skated in three games for the Canadiens this season, tallying no points and four penalty minutes. The 6-foot-5, 234-pound defenseman was Montreal’s third-round pick (79th overall) in the 2003 Entry Draft. 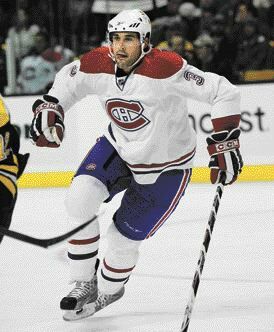 He dressed in a career-high 55 games during the 2009-10 season (1g/3a) and also appeared in 13 of Montreal’s 19 playoff contests. On Bournival: he was Colorado's third round pick in the 2010 Entry Draft. Possesses the ability to play in all three zones and a no-quit, win at any cost attitude. Bournival might not be the most talented player available, but his work ethic and dedication will help ensure that he becomes a viable NHL prospect. In other words, he's pretty much like every other Avalanche player. The organization has been drafting guys with "work ethic" and "dedication in all three zones" for years. That's why guys like Stastny, Duchene, O'Reilly, Yip, Hejduk, and Jones make up the forward corps. Bournival certainly has potential, but it will be hard for any prospect to crack Colorado's top-9 in the coming years. As for O'Byrne, he address a couple needs on the back end. First, he's gigantic. 6-5, 234 pounds. Second, he's a defenseman, something the Avs are ridiculously short of. With the prospects - Shattenkirk, Holos, Cohen, and Liffiton - playing pretty well right now, it'll be interesting to see who sits and what this means for those who are injured, specifically Wilson and Cumiskey whose names appear to be on the chopping block. O'Byrne has a cap hit of under a million, making him a perfect fit under current Avalanche management. What Should the New Lines Look Like? Peter Forsberg Reti-ATTEMPTING A COMEBACK! ?